Osborne Primary School is a large school of approximately 610 students located in Mount Martha, around 50 kilometres south of Melbourne on the Mornington Peninsula. Although initially established in 1873 to serve the needs of a largely rural population, the school is now close to a rapidly growing urban area to the east of Mornington. 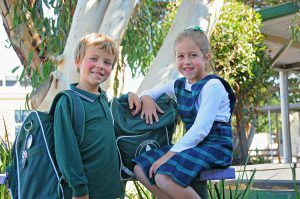 The school makes excellent use of its location near to Port Philip Bay and to sensitive wetland and bushland areas nearby. A collaborative learning community that challenges students to become creative thinkers, independent learners and globally responsible citizens transpires at Osborne. The values of respect, confidence, co-operation, responsibility and resilience guide us in providing a happy, caring and stimulating environment where children will recognise and achieve their fullest potential. The ‘Play is the Way’ social skills program is implemented school wide to enhance our school values and empower our students to pursue their personal best and develop respectful relationships. The Victorian Curriculum underpins teaching programs, which offers stimulating learning across a broad range of areas. Teaching to suit individual students’ learning needs is delivered through programs such as ‘Point of Need’ teaching in Mathematics and ‘Reading for Meaning’ reading comprehension programs. A combination of both explicit teaching methods and inquiry learning are used throughout the school. Four major concepts -: ‘Understanding, Diversity, Creating, and Sustainability’ are investigated through the inquiry process across the school. The specialist programs include Visual and Performing Arts, Physical Education, Languages – Indonesian, Science and the Stephanie Alexander Kitchen Garden Project. The partnership between the school and the home is highly valued at Osborne. Parents and carers are encouraged to be actively involved in the educational progress of their child. We pride ourselves on an “open door” policy whereby our parents and community are regularly involved with our learning programs and events. The Compass electronic communication system is used at Osborne to ensure families are well informed and connected to our school. Empowering students to take responsibility for their learning is integral to the students achieving their full potential. This is facilitated through opportunities for student voice, student decision making and choice. Our Student Representative Council is an active body in student decision making. Student voice is also enhanced through the student conducted radio station on site. At Osborne we optimise the use of the range of school facilities. Highlights are the collaborative spaces of the Birdrock building which houses Years 5 and 6, the purpose built kitchen for the Stephanie Alexander Program, the Gymnasium, the Performing Arts Centre, Visual Arts room, Science Lab and the extensive garden areas of the school. The school makes best use of the ample range of facilities to deliver a comprehensive curriculum and engaging educational opportunities for all students.